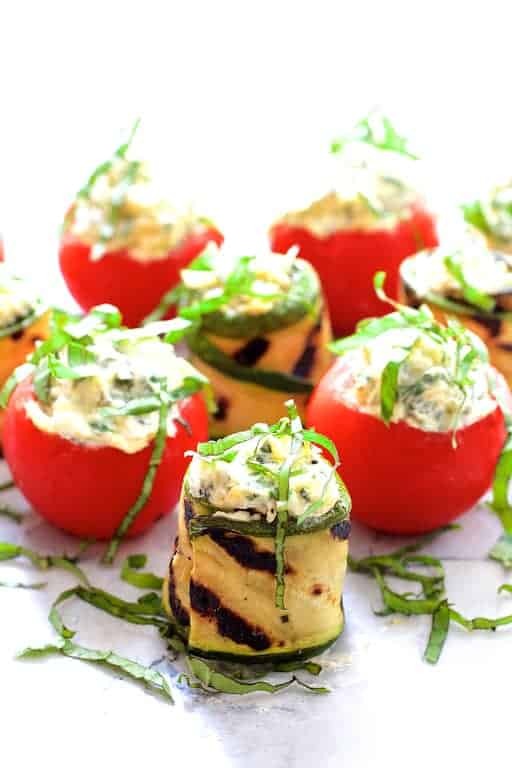 Cream Cheese and Artichoke Stuffed Tomatoes and Grilled Zucchini is a light, easy and elegant appetizer perfect for any summer occasion. Planning a summer party or celebration? 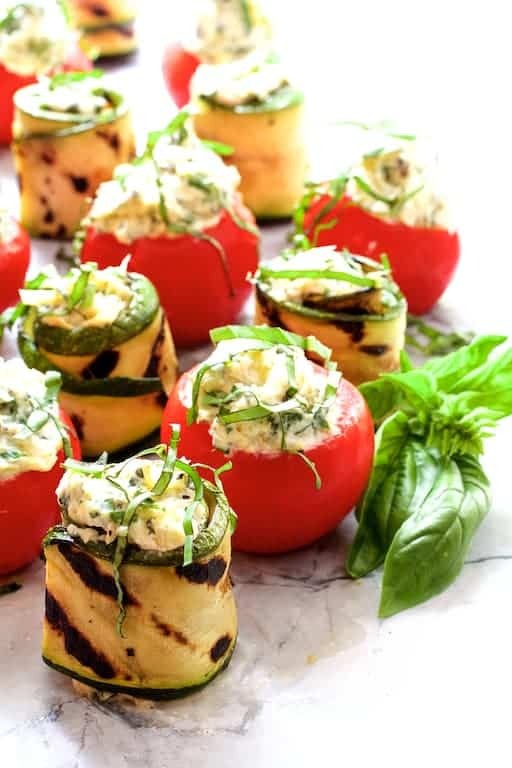 Cream Cheese and Artichoke Stuffed Tomatoes and Grilled Zucchini is a light, summery appetizer your guests are going to love! You’re going to love it because it’s easy, impressive and has a professionally catered flair! All this love starts with a great product, Weight Watchers Whipped Cream Cheese Spread. 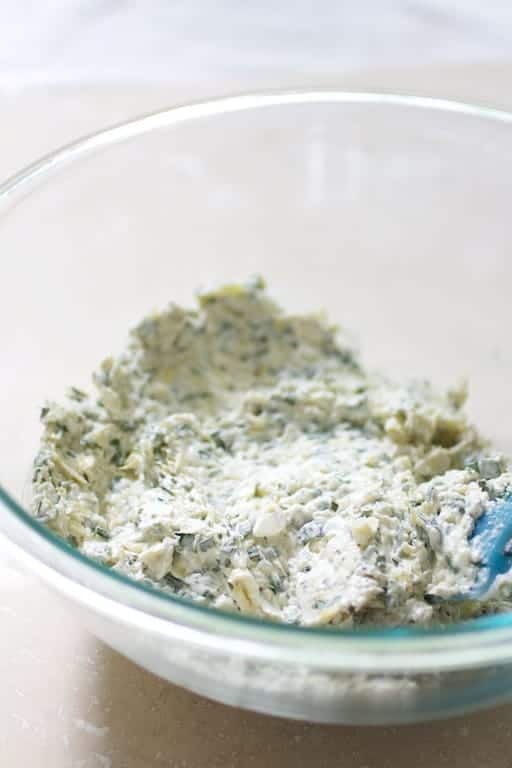 I added artichokes, fresh herbs, garlic and a touch of light mayonnaise to create a filling that’s perfect for tomatoes and grilled zucchini. No doubt you’ve heard of Weight Watchers. I went to Weight Watchers myself approximately 14 years ago. 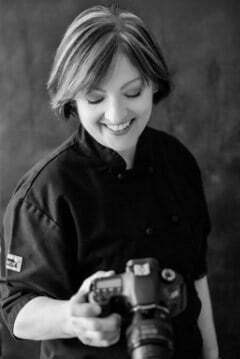 I learned a lot about portion control, healthier cooking methods and making healthier food choices–all things I’ve been able to use in my personal chef business. As a personal chef, I’ve cooked a lot of crazy diets over the years. Because I know the balanced, supportive approach of Weight Watchers works, I always suggest it to my customers. I own numerous Weight Watchers cookbooks so it makes it easy for me to provide my clients with great and healthful meals. 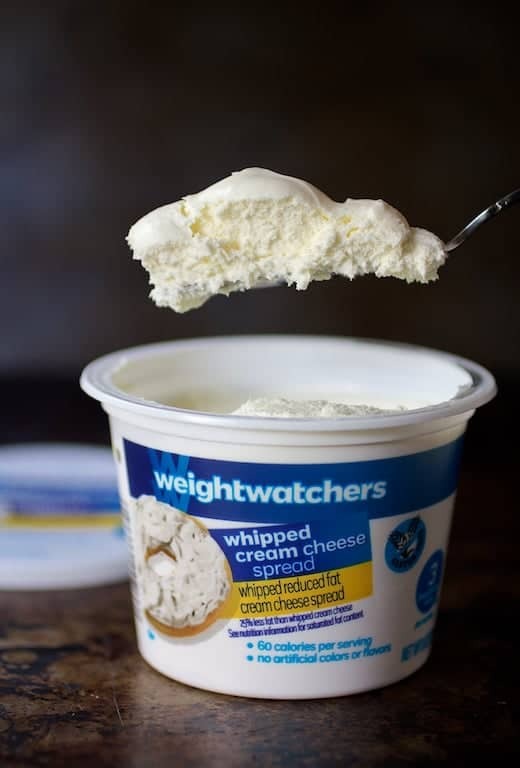 In addition to their supportive approach, Weight Watchers has numerous food products that can help you stay on track when you want to eat better, including this great all-natural reduced fat Whipped Cream Cheese Spread made from real dairy. I’m a Wisconsin girl so only real dairy and real cheese will do! Check out how light and fluffy it is! I’ve used it for my customers and they were never the wiser it was better for them because it doesn’t taste any different than a higher fat product. 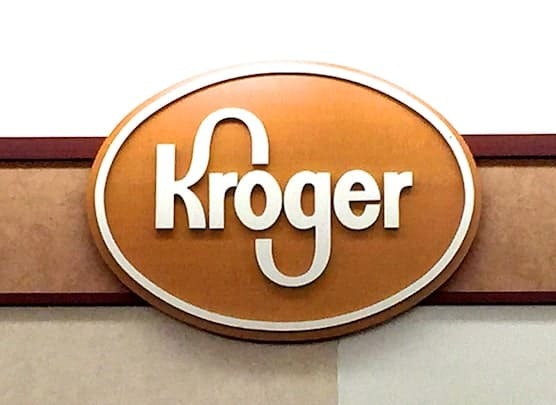 You can find it at your local Kroger in the dairy section. Now that you know about this wonderful product, let’s make this delicious light appetizer. When asked to bring something to one of the many gatherings we attend during the summer, I often bring this so I know there’s at least one item that won’t throw me off track. Tomatoes and zucchini are two of the best produce of summer. You’ll want to use Campari tomatoes, which are a variety (not a brand) of tomatoes. 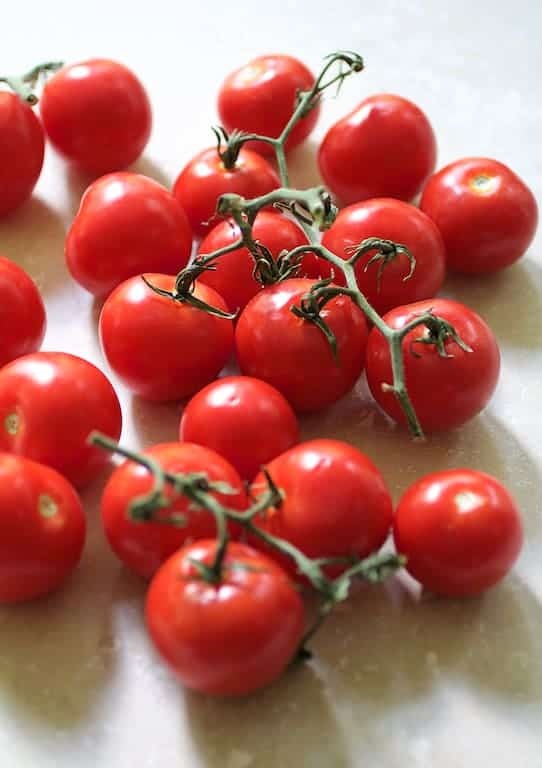 They’re larger than a cherry tomato and smaller than most other round varieties. For the zucchini, use similar medium-to-large-sized and select ones that are straight and firm. Make the filling first so the flavors have a chance to blend. Start with two 8-ounce containers Weight Watchers Whipped Cream Cheese Spread. Drain two 14-ounce cans quartered artichoke hearts. 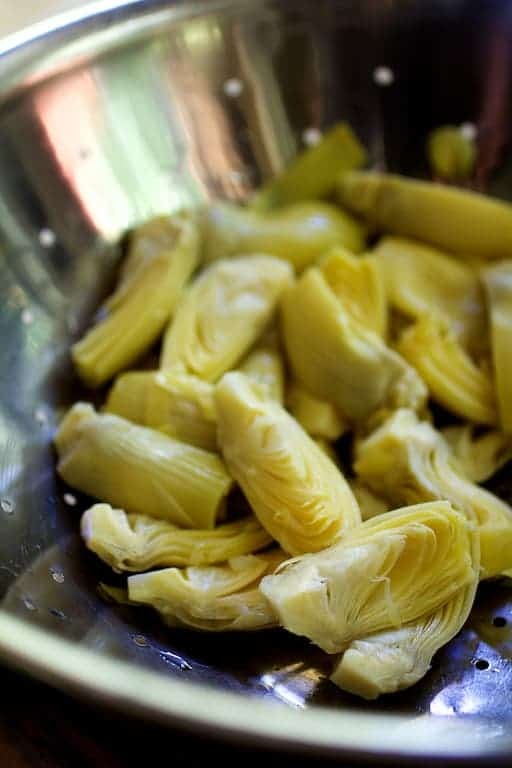 Thoroughly pat the artichokes dry, pressing as much water as possible from the artichokes. 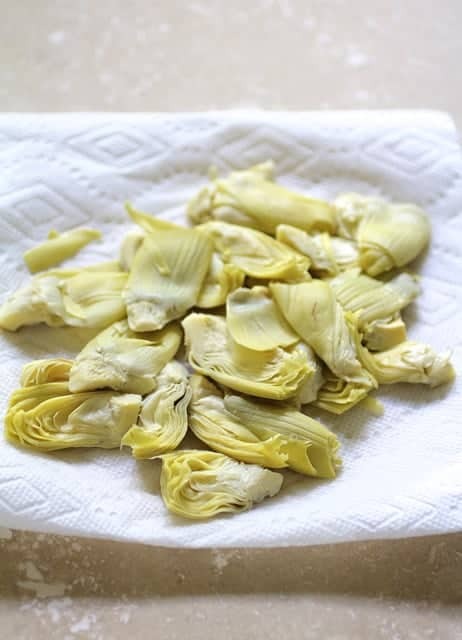 Finely chop the artichokes and herbs. 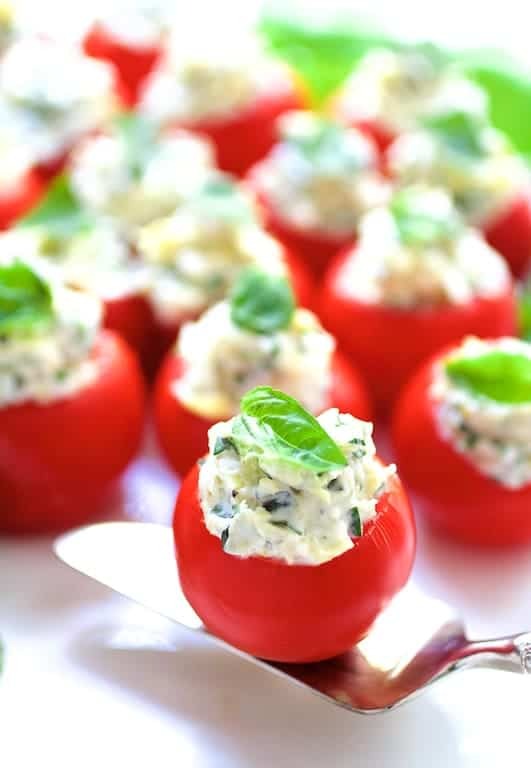 Place the filling ingredients in a bowl, mix well and refrigerate while prepping the tomatoes and grilling the zucchini. 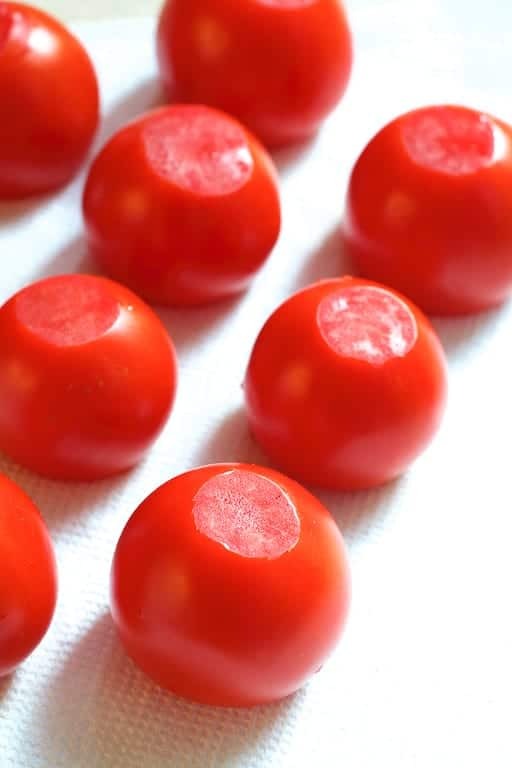 Remove a thin slice from the top and bottom of each tomato. 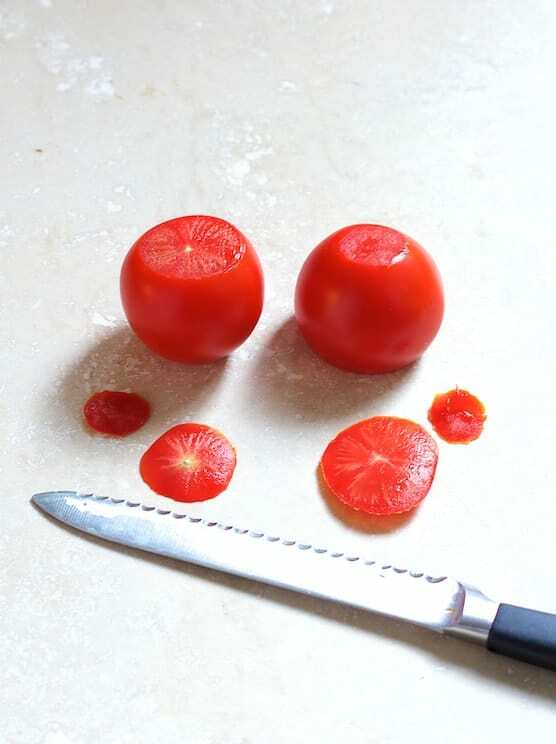 Removing a thin slice from the bottom will help the tomato stand straight and not roll around. 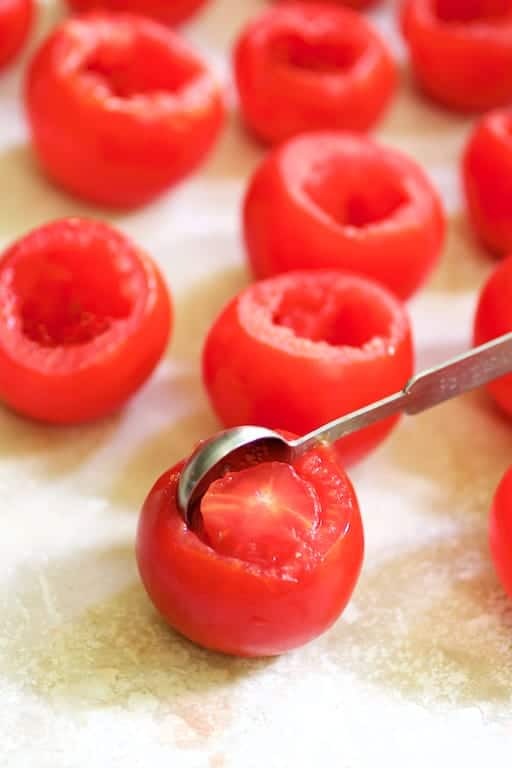 Using a small spoon, half-teaspoon measure or melon baller, carefully remove the pulp from each tomato. Invert onto paper towels to drain while prepping and grilling the zucchini. 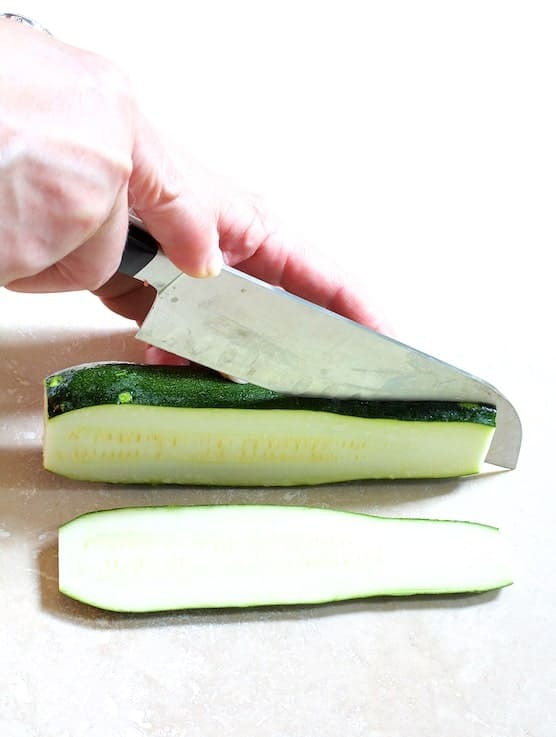 Slice the zucchini lengthwise into 1/4-inch thick “planks,” discarding the outermost sides. You can do this easily if you have a mandoline, however, it’s possible to do this freehand with a good sharp knife. Just do it slowly and deliberately. Start at one end and carefully progress as opposed to slicing straight down. Spray a nonstick grill pan with cooking spray, then preheat the pan over medium-high heat. Season the zucchini with salt and black pepper. 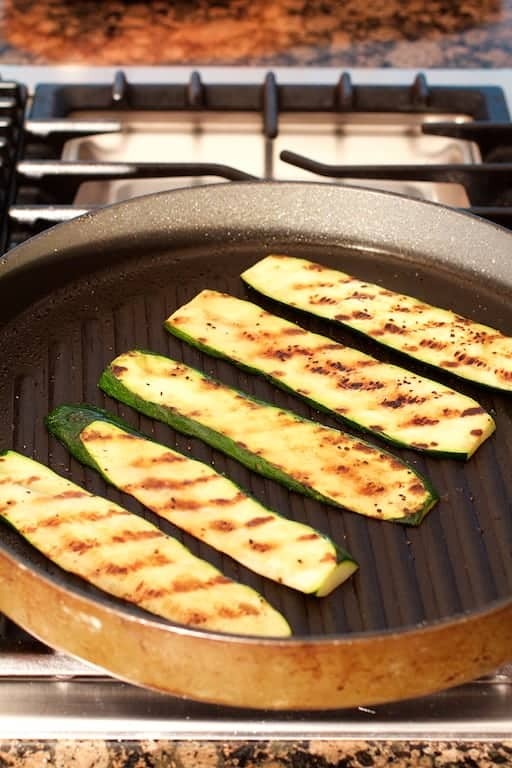 For the nicest grill marks, place the zucchini on the grill pan at a diagonal. 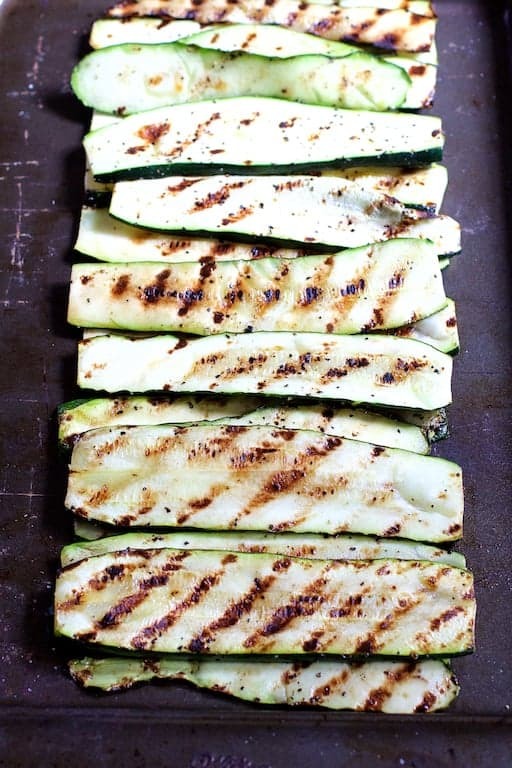 Grill the zucchini in batches until it’s nicely marked and pliable. You can do this on an outdoor grill, too, however, I prefer doing it on my stovetop on a nonstick grill pan so I don’t have to use oil (which adds fat and calories). While the zucchini is cooling, fill the tomatoes. 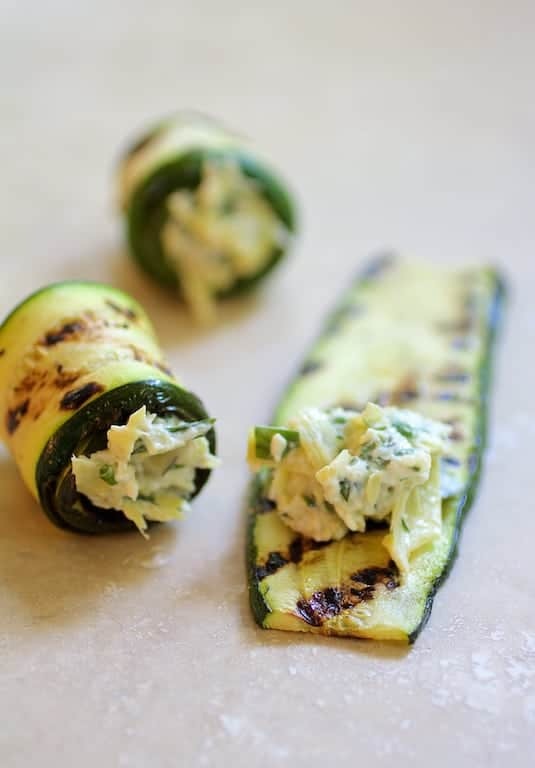 When the zucchini is cool, place approximately one level tablespoon filling on the widest part of the zucchini and simply roll up! Both the tomatoes and the zucchini can be made up to eight hours ahead and refrigerated. Serve on platters separately or together. Place the zucchini rolls seam side down or stand up. Garnish with fresh herbs or flowers. 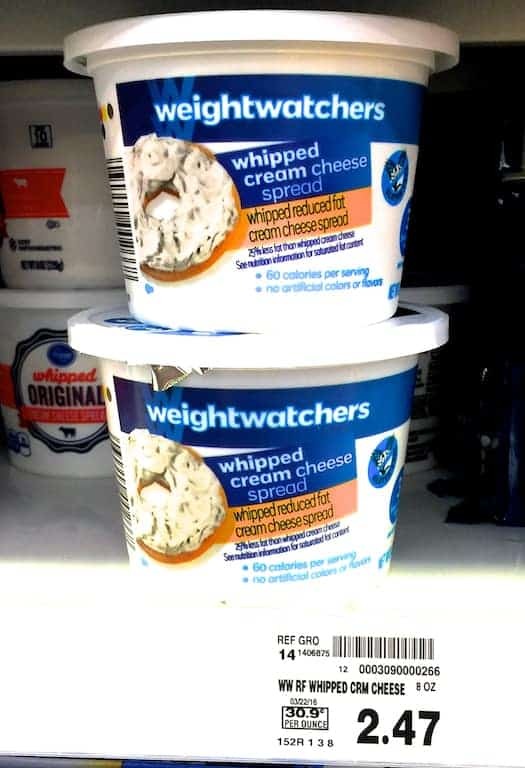 Do try wonderful Weight Watchers Whipped Cream Cheese Spread soon! You’ll be glad you did! Enjoy your party and enjoy your summer! 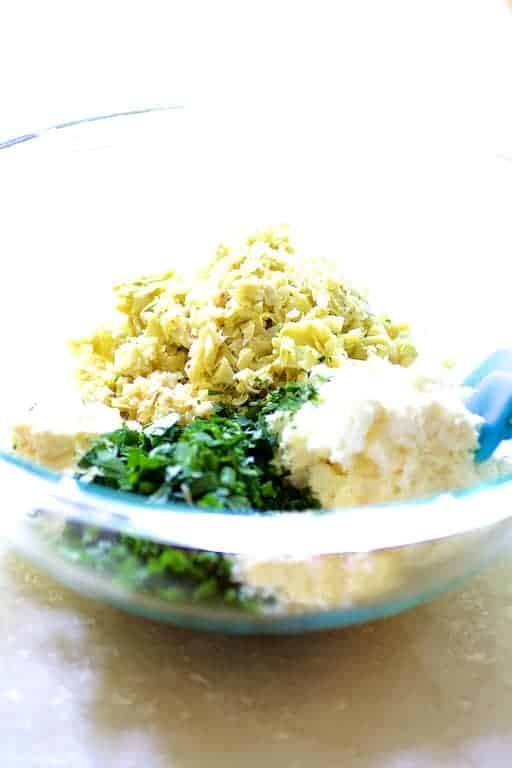 Combine Weight Watchers Whipped Cream Cheese Spread, artichoke hearts, mayonnaise, garlic and herbs in a bowl. Season to taste with salt and black pepper. Refrigerate until ready to use. Cut a thin slice off the top of each tomato along with a little from the bottom so they stand straight and don't roll around. Scoop out and discard the pulp. Invert onto paper towels to drain while prepping and grilling the zucchini. 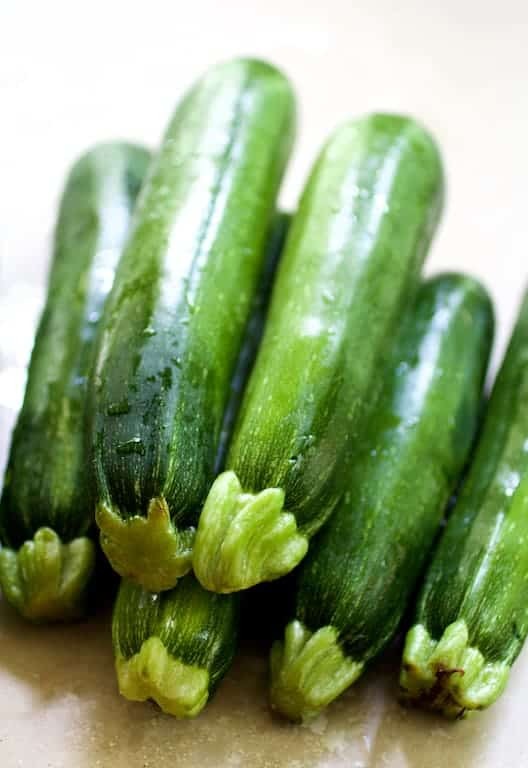 Remove the stem and flower ends of the zucchini and the outermost sides of the zucchini. 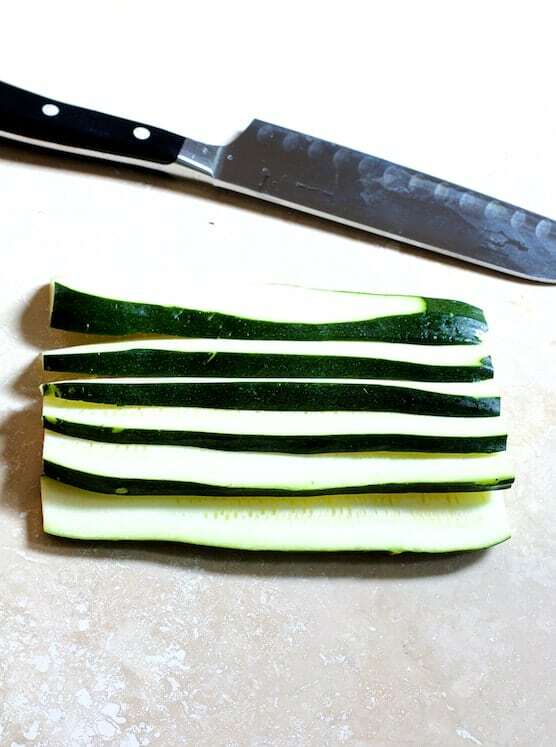 Thinly slice the zucchini lengthwise into 1/4-inch thick strips. Spray a nonstick grill pan with cooking spray. Heat the pan over medium-high heat. Working in batches, season the zucchini with salt and black pepper. Grill 2-3 minutes per side or until nicely marked and pliable. Let cool. Fill each tomato with equal amounts of the filling. 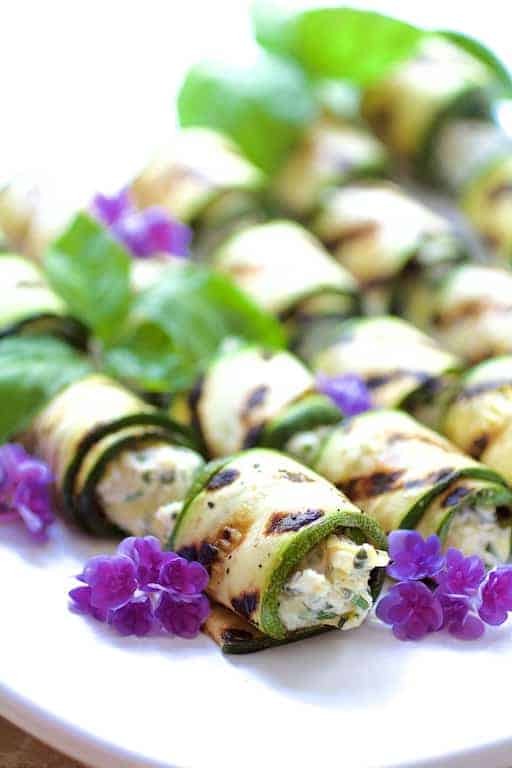 When the zucchini is cool, place approximately 1 tablespoon of the filling on the widest end of each zucchini strip and roll up. Serve the tomatoes and zucchini on platters, separately or combined. 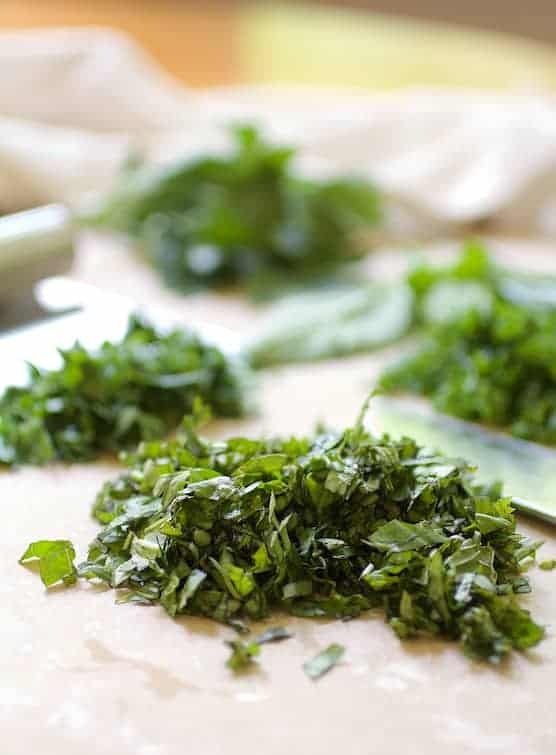 Garnish with fresh herbs. Can be assembled up to 8 hours in advance. Refrigerate until needed. Zucchini is a new favorite of mine. I love the idea of rolling up slices with the filling in it. Looks delicious!